The Group of Seven's affiliation to The Heeley Art Club is through two of the members of the group (Arthur Lismer & Frederick Varley) being original Heeley Art Club members. The Group of Seven — sometimes known as the Algonquin school — were a group of Canadian landscape painters from 1920 to 1933, originally consisting of Franklin Carmichael (1890–1945), Lawren Harris (1885–1970), A. Y. Jackson (1882–1972), Frank Johnston (1888–1949), Arthur Lismer (1885–1969), J. E. H. MacDonald (1873–1932), and Frederick Varley (1881–1969). Two artists commonly associated with the group are Tom Thomson (1877–1917) and Emily Carr (1871–1945). Although he died before its official formation, Thomson had a significant influence on the group. In his essay "The Story of the Group of Seven", Lawren Harris wrote that Thomson was "a part of the movement before we pinned a label on it"; Thomson's paintings "The West Wind" and "The Jack Pine" are two of the group's most iconic pieces. 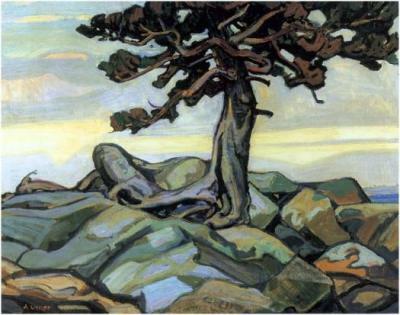 Emily Carr was also closely associated with the Group of Seven, though was never an official member. Believing that a distinct Canadian art could be developed through direct contact with nature, The Group of Seven is most famous for its paintings inspired by the Canadian landscape, and initiated the first major Canadian national art movement. The Group was succeeded by the Canadian Group of Painters in the 1930s, which did allow female members. Tom Thomson, J. E. H. MacDonald, Arthur Lismer, Frederick Varley, Frank Johnston and Franklin Carmichael met as employees of the design firm Grip Ltd. in Toronto. In 1913, they were joined by A. Y. (Alexander Young) Jackson and Lawren Harris. They often met at the Arts and Letters Club of Toronto to discuss their opinions and share their art. 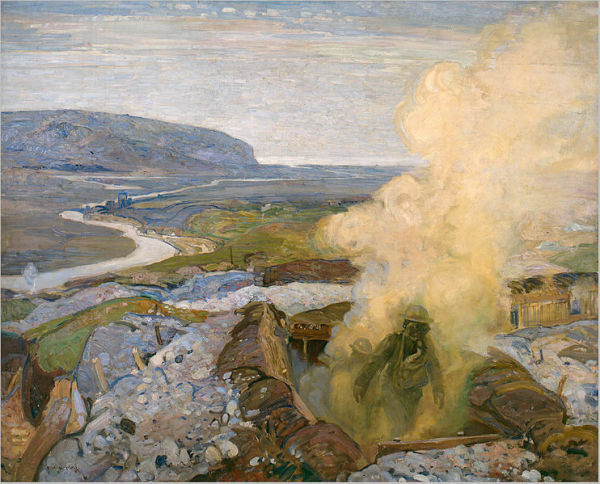 The informal group was temporarily split up during World War I, during which Jackson and Varley became official war artists. A further blow to the group came in 1917 when Thomson died while canoeing in Algonquin Park. He appeared to have suffered a blow to the head and showed no signs of drowning. The circumstances of his death remain mysterious. The seven who formed the original group reunited after the war. They continued to travel throughout Ontario, especially the Muskoka and Algoma regions, sketching the landscape and developing techniques to represent it in art. In 1919, they decided to make themselves into a group devoted to a distinct Canadian form of art which did not exist yet, and began to call themselves the Group of Seven. It is unknown who specifically chose these seven men, but believed to have been Harris. By 1920, they were ready for their first exhibition thanks to the constant support and encouragement of Eric Brown, the director of the National Gallery at that time. Prior to this, many artists believed the Canadian landscape was not worthy of being painted. Reviews for the 1920 exhibition were mixed, but as the decade progressed the Group came to be recognized as pioneers of a new, Canadian, school of art. After Frank Johnston left the group in 1920 to move to Winnipeg, A. J. Casson was invited to join in 1926. Franklin Carmichael had taken a liking to him and had encouraged Casson to sketch and paint for many years beforehand. The members of the Group began to travel elsewhere in Canada for inspiration, including British Columbia, Quebec, Nova Scotia, and the Arctic. After Samuel Gurney Cresswell and other painters on Royal Navy expeditions, these were the first artists of European descent who depicted the Arctic.Soon, the Group made the decision that to be called a "national school of painters" there should be members from outside of Toronto. So, in 1930, Edwin Holgate from Montreal, Quebec became a member and in 1932, also LeMoine Fitzgerald from Winnipeg, Manitoba. The Group's influence was so widespread by the end of 1931, and after J.E.H. MacDonald's death in 1932, they no longer found it necessary to continue as a group of painters. They announced that the Group had been disbanded and that a new association of painters would be formed, known as the Canadian Group of Painters. The Canadian Group -which eventually consisted of the majority of Canada's leading artists- held its first exhibition in 1933, and continued to hold exhibitions almost every year as a successful society until 1967. Finally, the large and unmanageable group was exceeded by smaller groups which were more structured and tastefully united. Large collections of work from the Group of Seven can be found at the Art Gallery of Ontario in Toronto, the National Gallery of Canada in Ottawa and the McMichael Canadian Art Collection in Kleinburg, Ontario. The National Gallery, under the directorship of Eric Brown, was an early institutional supporter of artists associated with the Group, purchasing art from some of their early exhibitions before they had identified themselves officially as the Group of Seven. The Art Gallery of Ontario, in its earlier incarnation as the Art Gallery of Toronto, was the site of their first exhibition as the Group of Seven. The McMichael was founded by Robert and Signe McMichael, who began collecting paintings by the Group of Seven and their contemporaries in 1955.